5a: Hits with the back side of her halberd, hits mid. 5b: Stabs with the point side of the halberd, hits mid, good range and speed. 2a: Hits with the back side of her halberd, hits low (Same as 5a but crouching). 2b: Vertical slash downwards , trips the opponent, hits low. 2c: Same as 2b, except she does it standing and takes a little longer, trips the opponent. 6a: Walks forward stabbing with the back side of the her halberd, hits mid. 6b: Does a standing vertical slash, hits mid. 6c: Launches the enemy very high by swinging with the back side of the halberd. 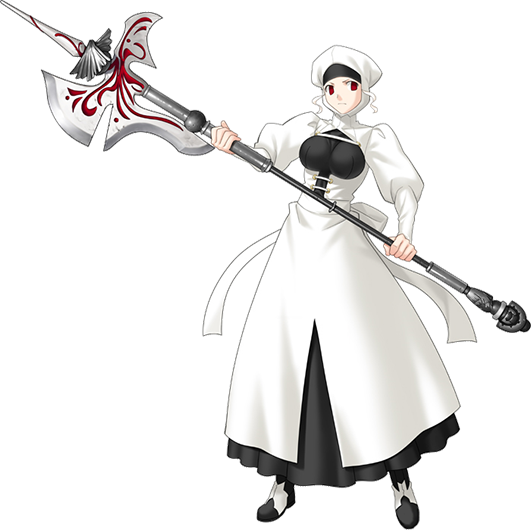 j.a: Hits with the back side of her halberd, while holding it behind. j.b: Slashes upwards, good air to air. j.c: Slams the halberd downwards, cleaving the ground, bounces the enemy. a version: Spinning slash, then cleaves, slamming the enemy to the ground. b version: 2 spinning slashes, trows the enemy far away. 623 a/b/c: Leysritt performs an upward slash, followed by attacks depending of the button. a version: 2 upward spinning slashes, jump cancelable, good combo starter and good anti-air. b version: 1 upward slash, then slams the ground. c version: A 3 slash combo that ends by a cleaving to the ground, bounces the enemy. 421 a/b/c: Her version of yamazaki SHAA arm attacks or Moriya 214 slashes. Can be canceled into any of the other attack button versions only once (214a then 214c for example). a version: Spins hitting upwards, sort of long range anti-air. b version: Spins hitting foward. c version: Spins hitting low. 214 a/b/c: Jumps foward then cleaves the ground, classic overhead attack. a version: Short up then cleave, good when used in a blockstring. b version: A high jump then cleave, it often jumps over the enemy when used in a close blockstring though, bounces the enemy. c version: A HIGH jump then cleaves and launches the opponent, hard to aim, use it from afar. 236236a: GURU GURU GURU GURUU. Leysiritt spins slashing and slashing, then launches her halberd slashing the enemy into the sky. If any of the spinning slashes hits, the enemy will be "locked" in the super and launched into the sky. 236236b: Leysritt starts praying and restores half of her super armor bar. Fills her super armor bar. 236263c: A single upwards slash, if it hits, Leysritts summons a ray of light that pierces the opponent. - You can replace any 623c with a 421b > 421a for more damage (mid screen), however you don't do the mana drain and it is more difficult to pull off.